In 2005, the City of Orlando projected that in a few years the spreading of sludge on the land would probably not be permitted by the State of Florida. 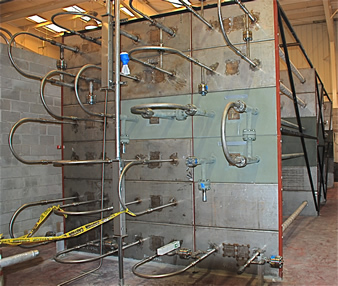 After several studies, the city decided that the superiority of supercritical water oxidation processing of sludge from the Orlando wastewater plants is so significant that it warranted taking the risk associated with being the first municipality to use the technology. To that end, the City of Orlando initiated a project, in partnership with SuperWater Solutions, to build a five (5) dry ton per day (DTPD) supercritical water oxidation demonstration plant. 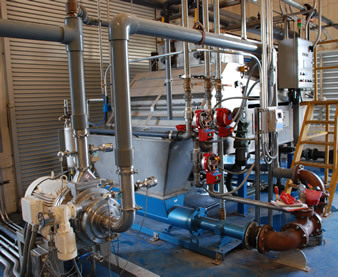 The SUPERWATER PROCESS demonstration system in Orlando has successfully operated in the supercritical region, and is now undergoing process optimization in preparation for commercialization. R. Donald Morgan is CEO of SuperWater Solutions, Inc. bringing more than 30 years of marketing and management experience in the process industries to the position. His most recent employment prior to joining SWS was as President, Koch Heat Transfer LP (KHT), a highly technical company with expertise in designing and building complex heat transfer systems for the chemical, petroleum and refining industries. KHT built the reactor module for the Orlando SCWO unit under Mr. Morgan’s management. This is the most critical element in the process chain and has given SWS excellent insight into how this element can be manufactured more easily and cost effectively. Before KHT, Mr. Morgan held a number of positions with other Koch affiliates and unrelated engineering companies. He holds a Bachelor’s degree in mechanical engineering and a Master’s degree in management from the University of Waterloo..
Les Strauss is a senior executive with an extensive background in the finance of high technology companies. Mr. Strauss was Chief Financial Officer (CFO) and Secretary at PictureTel Corporation, the market leader in video-conferencing equipment, from 1990 to 1997. During that period, PictureTel grew from $20 million in revenues to $480 million. Prior to joining PictureTel in 1990, Mr. Strauss served as a senior executive in various high technology companies. Since 1997, Mr. Strauss has served on the boards of a number of venture-backed startups. Mr. Strauss received an undergraduate degree in chemistry from The Citadel, an MBA from Columbia University, and a Masters Degree in Accounting from Bentley College. Dr. Gaut could be described as a serial entrepreneur. He co-founded Environmental Research and Technology (ERT) immediately after leaving the Massachusetts Institute of Technology with a Ph.D. in 1968. That company has morphed into a $400M part of what is today the engineering firm of AECOMM. After leaving ERT in 1985, he joined another very small spinoff from MIT called PictureTel. He lead that company to world wide leadership in the videoconferencing market with a peak of just under $500M in sales and 1600 employees. Since PictureTel, Dr. Gaut has founded several new companies, has sat on, and is sitting on, a number of Boards of high tech companies, and is a Life Member (trustee) of the Massachusetts Institute of Technology.